Welcome to Yalca Fruit Trees fruit tree shop. We are now open for the 2019 season. 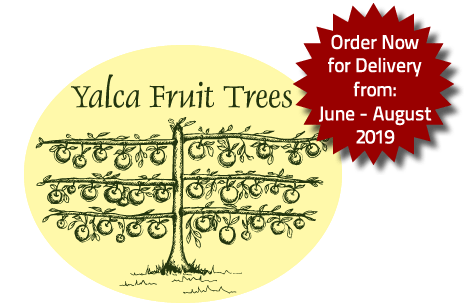 Welcome to Yalca Fruit Trees website and our 2019 heritage fruit tree catalogue. We are a mail order fruit tree nursery with a range of over 300 deciduous fruit and nut trees and berry plants, which we can send out to most places in Australia. Open for our 2019 season. Take a look through our Easy to use Shop and then place your order and pay using the secure checkout through our SECURE Credit Card facilities or you can checkout through our shopping cart and select to make a direct deposit as in previous years. We will send out an order confirmation and then wait till June, July and August when the trees go dormant and lose their leaves for winter time, then we send them out to you, ready to plant. We try to grow the best of both heritage and modern varieties of fruit trees. 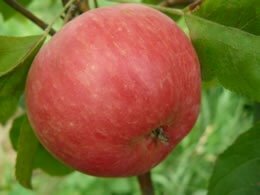 Our trees will suit home gardeners, people wanting to start an orchard – small or large, and people wanting to discover the wide range of flavours and luscious qualities of the many heritage fruit tree varieties. There are trees suitable for espaliering along a fence or trellis, varieties good for cider, perry and fruit liqueur making, fruits to suit bottling, preserving, jam making, drying or just eating sraight from the tree. Whether you are wanting to make your garden more useful, moving towards being self sufficient,wanting to take a step back from the supermarket food culture, or just wanting the kids to know where more of their food is coming from, you will be able to find trees in our catalogue to suit your purpose. With a bit of careful selection, you can plant an orchard that will provide your household with fruit for nearly twelve months of the year. 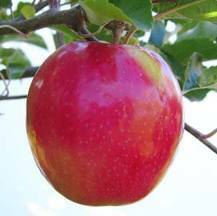 This winter we are offering a number of new dwarfing and semi dwarfing fruit trees, suitable for people with smaller backyards, or tighter spaces. Also good for those who are wanting to limit the height their trees will grow to, in order to make it easier when picking, pruning, netting etc. Some of the trees will also suit those who plan to espalier, or train to various shapes along flat fences and trellises. Many apple varieties this year will have the option of being supplied on M26 rootstocks, which yield a semi dwarf tree about 2 metres high. 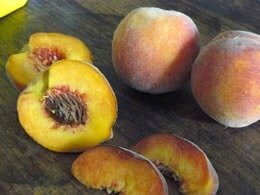 Other dwarf fruit trees on offer include Sunny Dwarf Nectarine, Val Miniature Peach, Valley Red Dwarf Peach, all of our semi dwarf Quince varieties, Jiro dwarf persimmon, Fuyu semi dwarf Persimmon, Morello and Kentish Sour Cherries, the Dwarf Self Pollinating Almond. 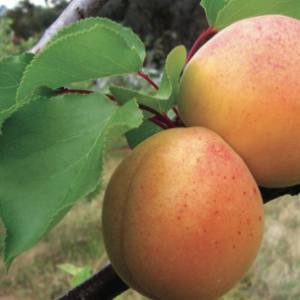 Also the latest semi dwarf stone fruits including Dwarf Moorpark apricots, and Dwarf Satsuma blood plums, which grow to approximately 2 metres in height at full maturity – these give a genuine full crop fruit load, on a properly dwarfed stone fruit tree – excellent backyard tree options.